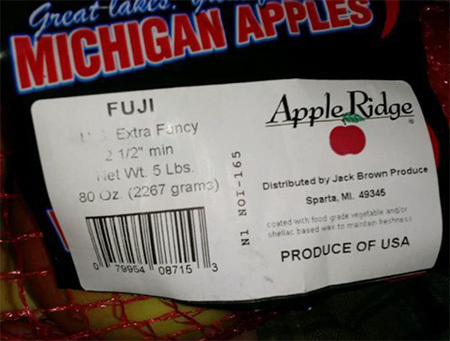 Jack Brown Produce is recalling certain types of apples due to possible Listeria contamination. Courtesy photo. Jack Brown Produce, Inc. of Sparta, Michigan, is recalling Gala, Fuji, Honeycrisp and Golden Delicious apples processed and shipped by one of its suppliers, Nyblad Orchards, Inc., on December 11 through December 16, 2017, because they have the potential to be contaminated with Listeria monocytogenes, an organism which can cause serious and sometimes fatal infections in young children, frail or elderly people, and others with weakened immune systems. Although healthy individuals may suffer only short-term symptoms from Listeria such as high fever, severe headache, stiffness, nausea, abdominal pain and diarrhea, Listeria infection can cause miscarriages and stillbirths among pregnant women. No illnesses have been reported to date. Gala, Fuji and Honeycrisp apples that were tray-packed/individually sold. Gala: NOI 164, 166 on either the product labels and/or bag-closure clip. The recall was the result of a routine sampling program at the Nyblad Orchards, Inc. facility which revealed that finished products contained Listeria monocytogenes. Jack Brown Produce, Inc. has ceased the distribution of any further products processed at Nyblad Orchards as the FDA and the Company continue their investigation as to what caused the problem. Consumers who have purchased Gala, Fuji, Honeycrisp and Golden Delicious Apples under the brand name “Apple Ridge” on or after December 11, 2017 are urged to destroy the product and contact Jack Brown Produce, Inc. for a full refund. Consumers with questions may contact the company at 616-887-9568 (Monday-Friday, 8:00 a.m. to 5:00 p.m. ET) and ask for Lisa Ingalls. Picture yourself harvesting a few fresh strawberries for your cereal in the morning or perhaps picking a few apples from your own backyard tree to cook up into a pie. It is possible, even if you garden on a balcony or small lot. And even if you have plenty of space, you will still appreciate the fun and convenience of reaching out the backdoor and harvesting some homegrown fruit. 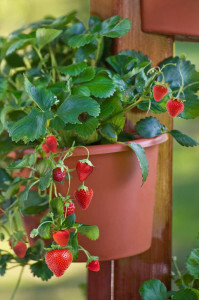 Strawberries are excellent container plants. Grow everbearing or day neutral varieties, so you will be harvesting strawberries throughout the growing season. Reduce your workload and increase success with a self-watering hanging basket (gardeners.com). Or dress things up a bit more with a decorative container. The haystack hanging baskets have the beauty of the coco fiber lined planters, but require half the watering. The AquaSav™ liner is a combination of coir and recycled plastic designed to conserve moisture. This means better results with less watering. But don’t stop there. Add some dwarf fruit trees to your patio plantings. A dwarf apple, peach or pear will provide beautiful spring flowers, nice foliage for the summer and fruit for you to enjoy. Select self-fertile varieties, those that only require one plant to produce fruit, if space is limited. Grow your dwarf trees in large weather-proof pots with drainage. Those in cold climates will need to provide some winter protection, but the first harvest will make that extra bit of work well worth the effort. Or try your green thumb at growing lemons, limes and other citrus in a container. The fragrant flowers and glossy green leaves are a beautiful prelude to the tasty fruit. Even cold weather gardeners can put their green thumb to the test by growing a Meyer lemon, Kaffir lime or other citrus in a container. Just move the potted plant indoors for the winter and back outdoors next season once the danger of frost has passed. And don’t forget the blueberries that are high in antioxidants and flavor. These nutritious beauties require moist well-drained acidic soil. Something most gardeners do not have. This makes growing them in containers, where you control the soil, a good option. Blueberries provide seasonal interest with their nodding white bell-shaped flowers in spring, colorful fruit in summer and yellow, orange or red color in fall. Though only one plant is needed to bear fruit, keep in mind that your harvest will more than double if you grow two. So survey your patio, deck, balcony or garden for space to add a container or two of fruiting plants that are sure to add beauty and flavor to your garden and meals this season. Fall is here and that means Michigan’s largest and most valuable fruit crop—the apple—is ripe and ready to tantalize your taste buds. Michigan is the nation’s third largest producer of apples, producing an average of 18 million bushels each year. About 37,000 acres are used for apple production, with the majority of farms covering less than 200 acres, and 950 apple growers living and working in regions near Lake Michigan and along the western part of the state. Michigan also plays a vital role in processed apples. About 60 percent of Michigan’s apples are processed into another product such as pie filling, applesauce, jellies, butter, juice, cider and vinegar. We are also the leading producer of slices for commercially-prepared apple pie. Longtime favorite varieties still dominate Michigan’s orchards. The most prevalent variety remains the Red Delicious, followed closely by the Golden Delicious. The Gala is rapidly gaining on tradition, however. The Honeycrisp variety is continually growing in popularity. Look for it in September and October, and enjoy it while you can, as it will most likely be gone by mid-November! A growing number of Honeycrisp tree plantings still aren’t in pace with its popularity among consumers! Honeycrisp has a crisp, juicy bite and a sweet flavor. They are best for fresh eating and also a great addition to salads. Everyone knows Michigan Apples taste great, but they also keep you healthy and strong. Apples are a naturally fat-free, saturated fat-free, cholesterol-free and sodium-free food, and are an excellent source of fiber. Loaded with powerful flavonoids and antioxidants, they’re perfect for every diet and every part of your body. The Michigan Apples website (www.michiganapples.com) gives tips on which apples work best in baking and cooking, and has some great recipes submitted by Michigan residents. Try the one on this page by Mary Gardner, of Cedar Springs, who was runner-up in the 2011 recipe contest. If you have a favorite apple recipe, send it to us at news@cedarspringspost.com. (ARA) – The arrival of the cooler weather means different things to many different people – football season, the vibrant colors of the changing leaves, hot chocolate, snuggly sweaters and a vast array of festive flavors that reinvigorate cooking and baking routines. Surprisingly, these seasonal comfort foods don’t have to wreak havoc on your waistline. Many of this season’s hottest flavors are naturally low in calories, and even offer essential vitamins, minerals and fiber to help you take small steps towards healthier eating while enjoying the foods you love. Warshaw also recommends taking smart shortcuts, wherever possible, and incorporating high-nutrient ingredients into your favorite seasonal dishes. With the right knowledge, cooking and baking with a little boost of fiber has never been easier. As the ‘star’ in many holiday baked goods such as pies, muffins, breads and more, pumpkin is definitely one of the season’s most delicious and nutritious flavors. Give your favorite pumpkin recipe a fiber boost by ditching the sugar and baking with SPLENDA with Fiber, Granulated, a no-calorie sweetener for foods and beverages with three grams of fiber per tablespoon. “With this product, you get a two-for-one bonus—more fiber with less added sugars,” says Warshaw. Nothing signals the arrival of sweater-season like a bowl of chili that warms you from the inside out. Give your chili a fiber makeover by opting for kidney and black beans and tossing in some fiber-rich Swiss chard. Cut calories by skipping the meat or using lean turkey and give your dish an added twist by adding butternut squash and lightly garnishing with pine nuts. The end result: a dish that will keep you full and satisfied all day. “An apple a day keeps the doctor away.” This saying has never rung more true – the apple and its skin are among nature’s fruits that are highest in fiber. Skip the season’s candy apples that line grocery store shelves and go for some homemade baked apples instead. Cut down on added sugars by baking your cored apples in a blend of cinnamon, nutmeg, raisins and all-natural apple juice. Who said satisfying your sweet tooth couldn’t be healthy? Great as a salad-topper, in trail and snack mixes, or simply enjoyed on their own, dried fruits can be sweet and natural treats with health benefits. Rich in antioxidants, dried cranberries are a great source of vitamins and fiber. Pair the festive cranberry with the fiber-rich almond for a simple snack that will double as brain food and help you stay full and focused in between meals. A classic in seasonal casseroles, pies and soups, sweet potatoes are on the top of the list when it comes to great-tasting and versatile fiber-rich vegetables. Slice up and drizzle with olive oil and kosher salt to serve mouthwatering, homemade French fries, or bake in a low-fat casserole to enjoy an easy and delicious treat with some serious health benefits.